Our dogs deserve a little love on this day too! So in honor of Valentine’s Day, Blue Dog Bakery has donated this tasty treat for one lucky Little Pampered Dog. 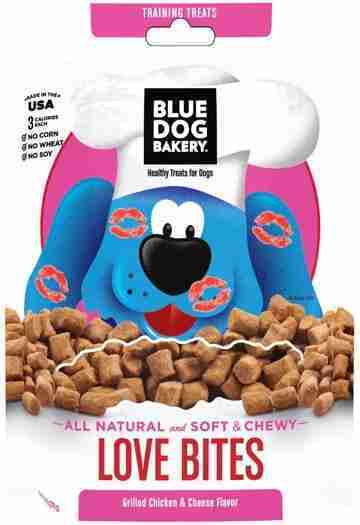 Most Blue Dog Bakery treats can be found at your local super market and pet food outlets. My favorite place to purchase these treats are on Amazon. This particular treat is exclusively available at PetSmart. Of course, if you’re the winner of this giveaway, you’ll get 2 bags sent directly to you! Thank you to Online-Sweepstakes.com for listing this giveaway. 1. 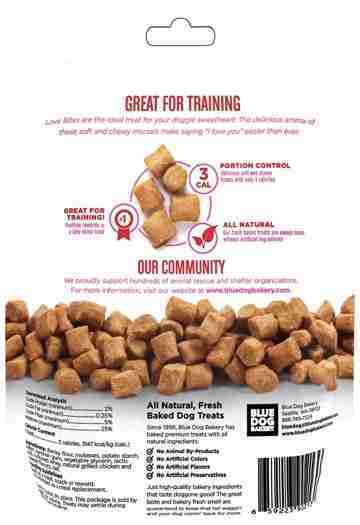 Promotion Description: The ‘Love Bites – Healthy Treats for Dogs’ (“Sweepstakes”) begins on 02/15/2018 at 12:00 AM (Eastern Time (US & Canada)) and ends on 02/22/2018 at 12:00 AM (Eastern Time (US & Canada)) (the “Promotion Period”). By participating in the Sweepstakes, each entrant unconditionally accepts and agrees to comply with and abide by these Official Rules and the decisions of Little Pampered Dog (“Sponsor”), which shall be final and binding in all respects. Sponsor is responsible for the collection, submission or processing of Entries and the overall administration of the giveaway. Entrants should look solely to Sponsor with any questions, comments or problems related to the Sweepstakes. 2. Eligibility: Open to legal residents of United States who are 18 Years or older. Void where prohibited or restricted by law. Sponsor and their respective parents, subsidiaries, affiliates, distributors, retailers, sales representatives, advertising and promotion agencies and each of their respective officers, directors and employees (collectively, the “Promotion Entities”), and members of their immediate families and/or persons living in the same household as such persons, are ineligible to enter the Sweepstakes or win a prize. 3. Winner Selection: The winner of the Sweepstakes will be selected in a random drawing from among all eligible Entries received throughout the Promotion Period. The random drawing will be conducted by 72 Hours by Sponsor or its designated representatives, whose decisions are final. Odds of winning will vary depending on the number of eligible Entries received. Winner will be notified by email at the email address provided in the Entry Information on or about 72 Hours after the random drawing. Potential winner must accept a prize by email as directed by Sponsor within 48 hours of notification. Any winner notification not responded to or returned as undeliverable may result in prize forfeiture. The potential prize winner may be required to sign and return an affidavit of eligibility and release of liability, and a Publicity Release (collectively “the Prize Claim Documents”). No substitution or transfer of a prize is permitted except by Sponsor. 5. Online Entry: Enter the Sweepstakes during the Promotion Period online by signing into the entry form and perform the tasks provided. The entry form can be found on the following website at http://littlepampereddog.com/giveaway-love-bites-by-blue-dog-bakery/. 8. Winner’s List: To obtain a copy of any legally required winners list or a copy of the Official Rules, send the applicable request and a self-addresses, stamped, #10 envelope to Little Pampered Dog cc: Love Bites – Healthy Treats for Dogs at 4101 South Indian River Drive, Fort Pierce, FL 34982. Request must be received no later than 72 Hours + 6 MONTHS for the name of the winner and, by the end of the promotion, for a copy of the rules. my dogs eat these every night its their nite nite snacks. Awww! How cute. I’m so glad they get good “nite nite” snacks. What kind of dogs do you have? My little Hollie and Molly would love to win these. Thank you for this awesome sweep !!!!! Well, I wish Hollie and Molly very good luck! I love how their names rhyme! And…thank YOU for participating! We like to keep it fun around here! Our rescue dog Artie would love some treats. He is looking forward to hiking this weekend. Thank you for rescuing Artie! What a great life he has to be able to enjoy hiking with his favorite person! Good luck Artie in the giveaway! My two little doggies, Apple and Brownie, would love this! Good luck Apple and Brownie! Thank you for this great sweepstake! I had not seen your FB page and didn’t know about your treats. We have two dogs, who would love them, I am sure.